I have been working on a mini-makeover in our playroom/media room/exercise room/man cave space and wanted to share the window valance I made to coordinate with the other window treatment. 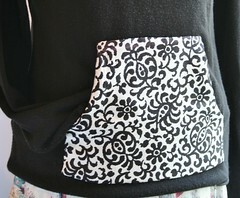 For more information about the work-in-progress mini-makeover please head over to Kitsch Designs for all the details. 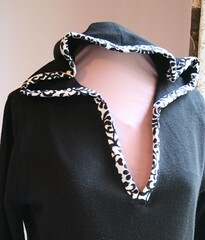 This is another one of those projects where I am making do with what I already own. I happened upon an old set of curtains and the leftover fabric from that project. 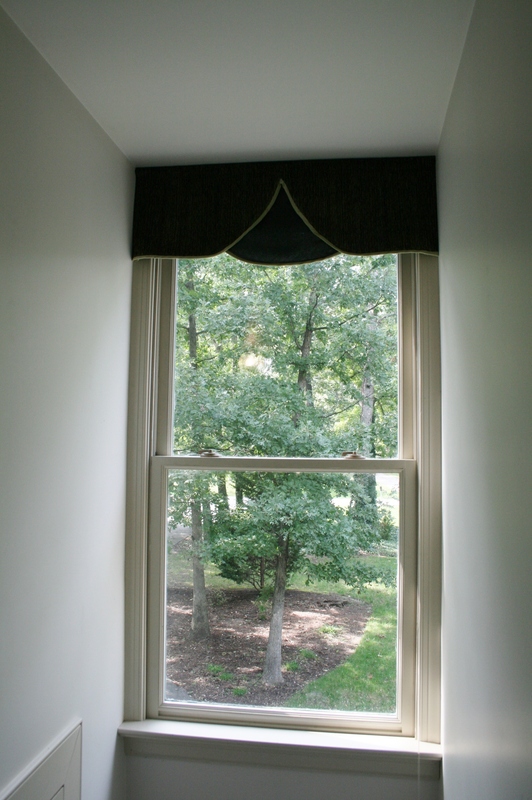 Lucky for me I still had enough to make a coordinating valance for the dormer window after using the curtain panels to flank the only other window in the space. I decided that I wanted something made from the same fabrics, that would look good with, but not exactly the same as the curtain panels. I took my measurements and went to work. 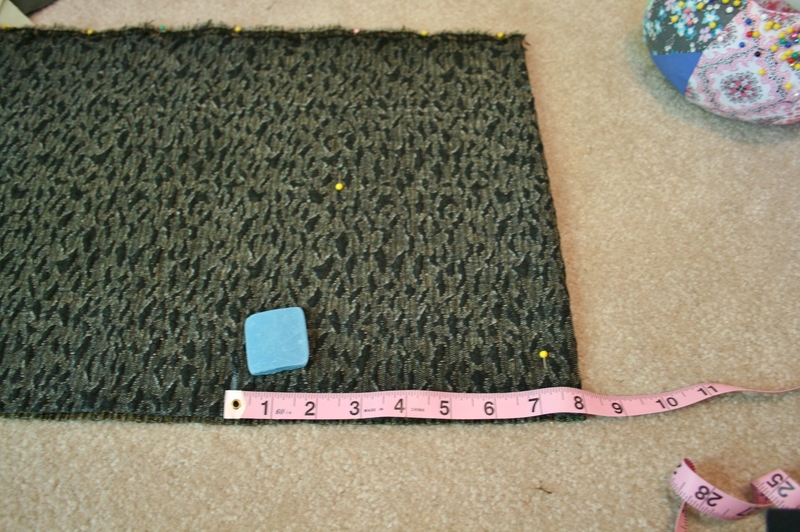 First I cut a long rectangle of fabric around 13 inches long and 36 inches wide. I wanted the valance to hang from the ceiling all the way down past the lovely builder’s blinds when they are pulled up and tight. 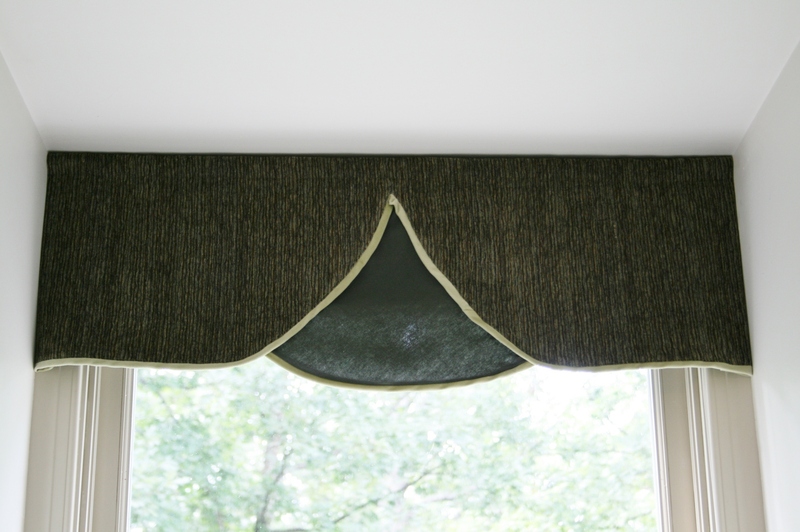 I also decided to give the valance a scalloped design so that I could incorporate each of the fabrics used in the original curtain panels. 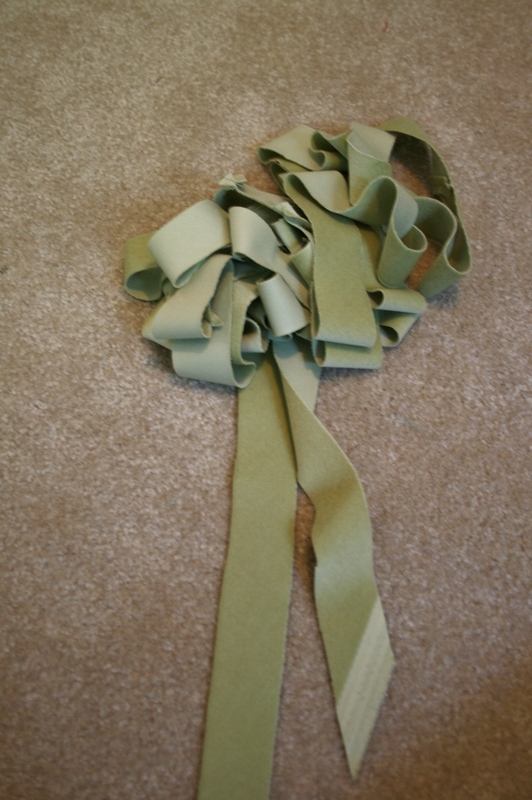 There was a heavily textured corduroy fabric, a plain dark charcoal gray cotton and a light green velvet for the trim. 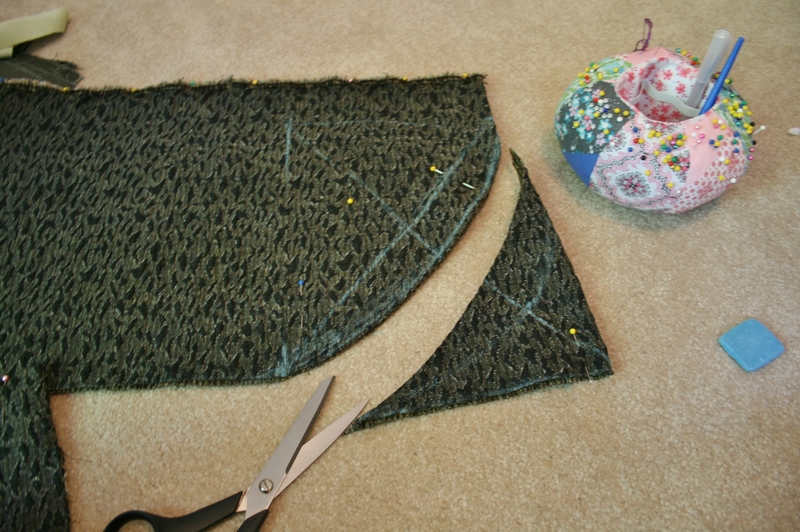 I wanted a large cut-away scallop in the center of the rectangle of corduroy fabric with the dark gray fabric showing through the cut-away from behind. 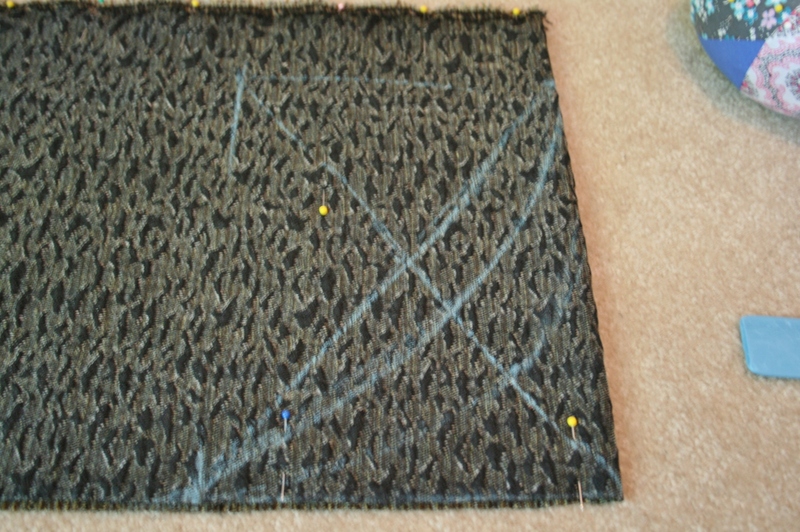 I used a piece of the dark gray fabric that had already been cut into a curve from the original curtain panels, to take measurements in order to determine how much of the middle section of the corduroy rectangle to remove. I marked a rectangle connecting the height and width of the area I wanted to remove and then added an X connecting the corners of the rectangle. Then I created the curve at what I “eye-balled” to be the right spot along the X, drawing the lines with tailor’s chalk within the chalk rectangle. 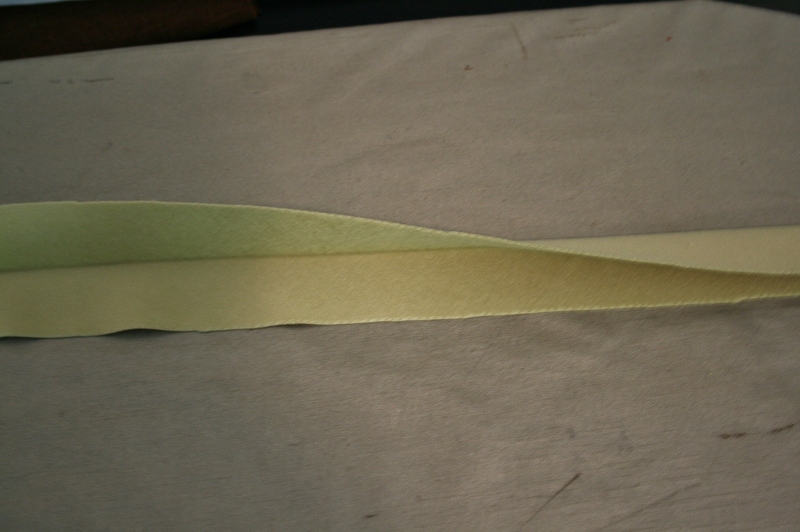 Next I cut down the little leftover triangle of green velvet to add to the strip of bias I had already cut from the original project. 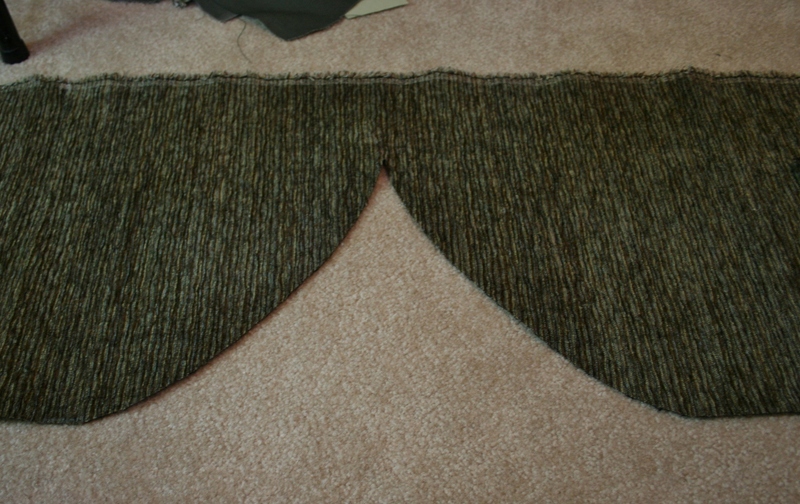 The strips were about 2 inches across once I had them all stitched up and plenty long enough for both valances. If you don’t know how to make bias strips there is a wonderful tutorial over at Coletterie about it. 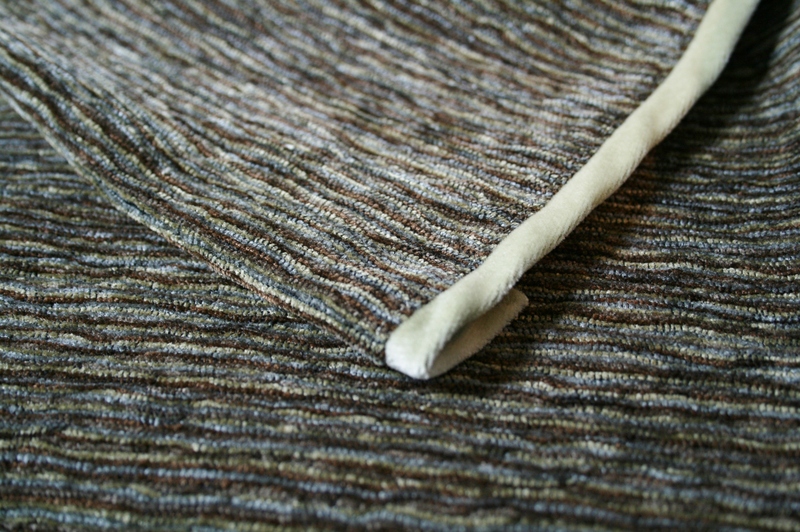 Since I did not plan to add piping to this trim I pressed the entire strip in half and then cut along that folded line. Now I had two strips at around 1 inch each. 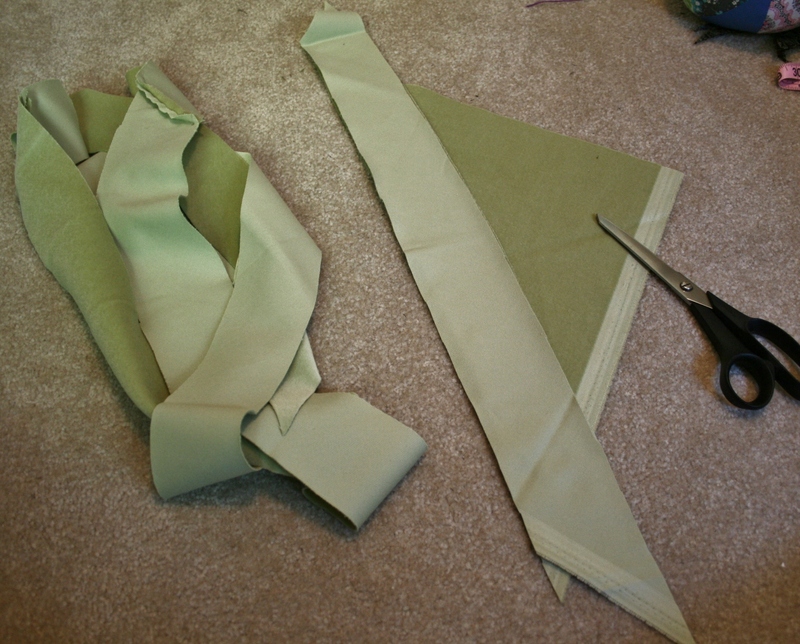 I folded the smaller strip in half and pinned it along the cut curved edge of the long rectangle of corduroy fabric, making sure that the right sides were together and the cut edges were matched up. 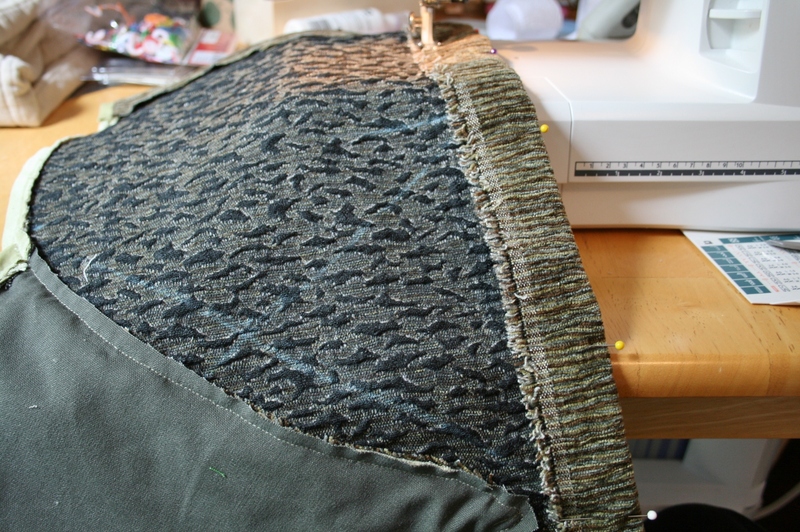 The plan was to flip this over once stitched in place to create a finished, trimmed edge to the main piece of the valance. 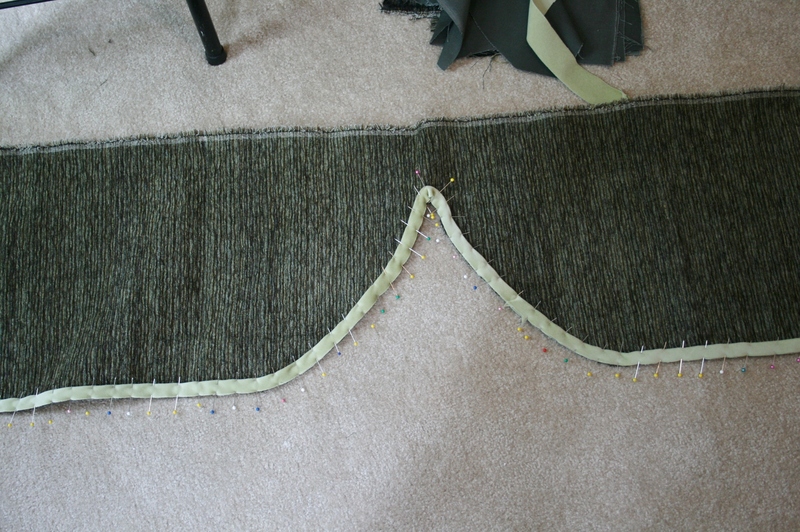 I edged the curve of the dark gray piece of fabric too and ironed along all the trimmed edges. Next I pinned the gray fabric piece in place along the trimmed edges of the curve in the middle of the corduroy rectangle. Starting at the very end of the trim at the bottom of the corduroy rectangle, I ran a line of stitches right next to the trim seam line to hold it in place and keep it flat while hanging. 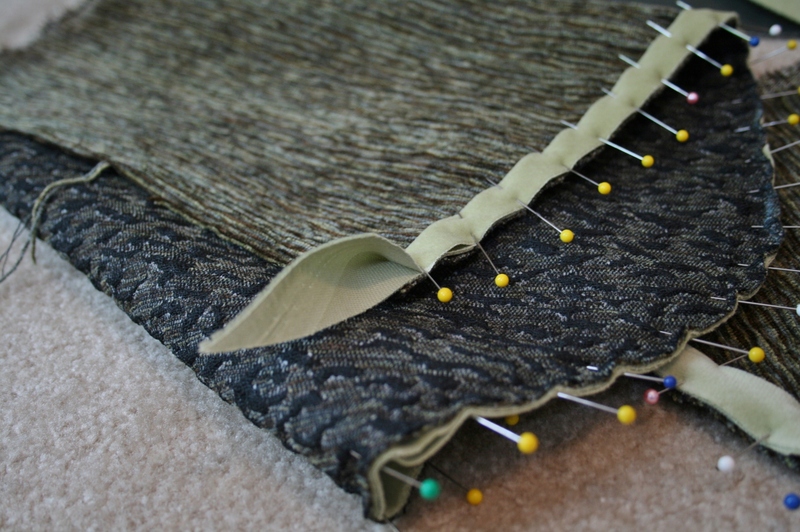 I also used this same line of stitching to attach the dark gray piece of fabric to the middle of the valance. 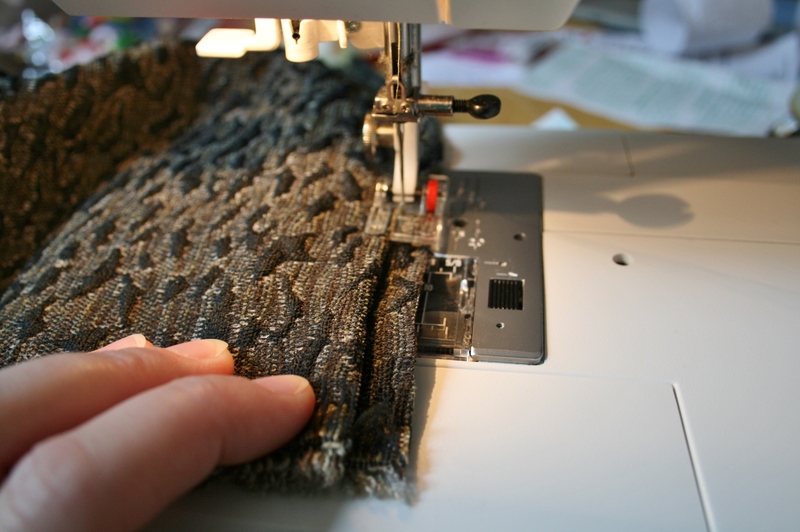 Once I was satisfied that everything was going to lay flat I trimmed away the excess gray fabric and pressed the seams flat. 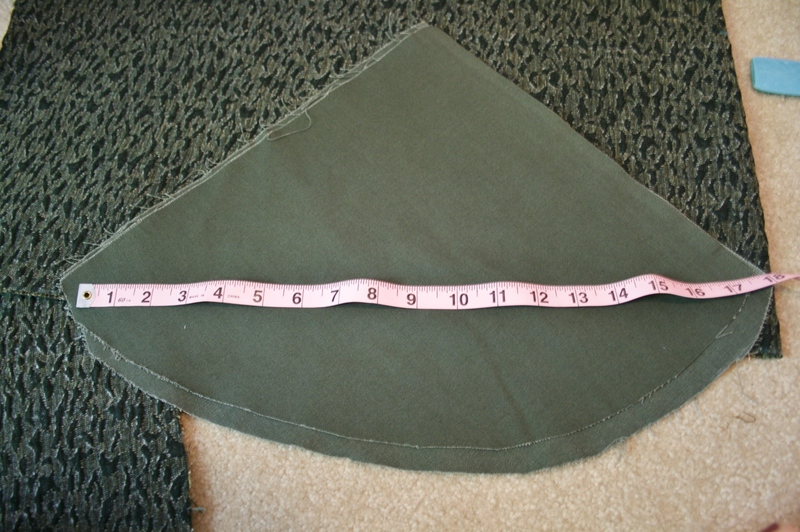 To keep the bulk down with the heavy corduroy fabric I used a blind hem stitch to clean up the sides and a straight seam along the top edge to create the tension rod pocket. 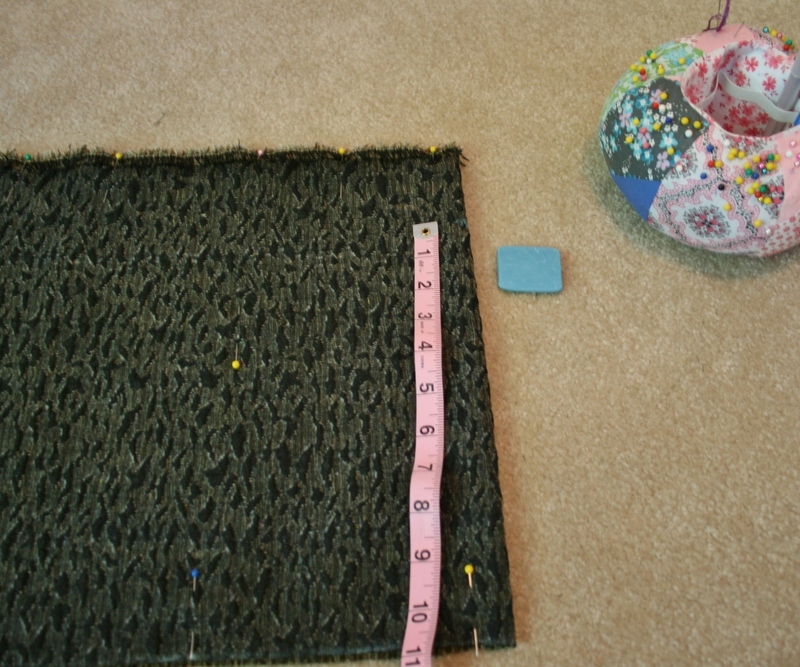 I was sure to measure the length from the top to the bottom before stitching just to be sure the rod pocket was going to be straight and the valance would hang level. The only thing that is really off with the whole project is the gray curved piece, but that is simply due to my laziness in not wanting to figure out how to make a perfect curve. I played around with that piece for a while and decided, for this project, it did not bother me that it was a little off. 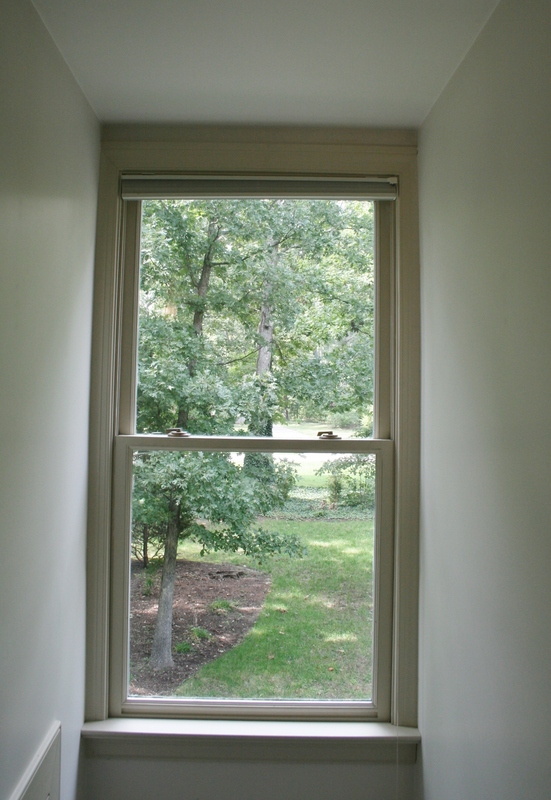 For a free solution to the dormer window treatment I think this one ended up working out pretty nicely. Have you all created anything recently from your leftover scraps?